I had half of pork tenderloin on hand and wasn’t so sure how am I going to cook it. It’s too cold outside to consider BBQ, schnitzel we had not long ago so I have settled on making a roll. 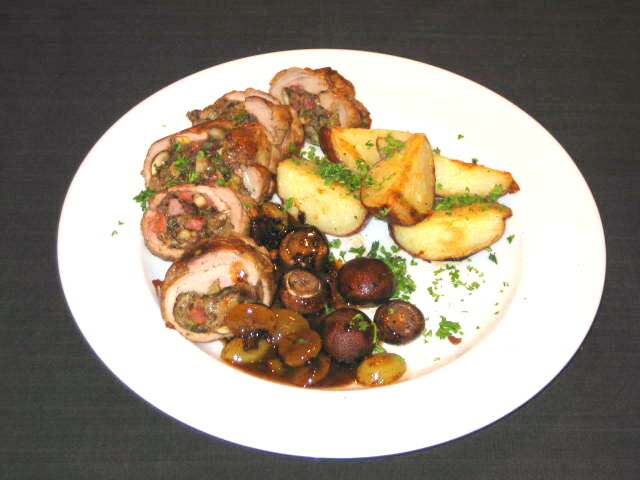 I have used tenderloin before in Pork Tenderloin Roulade so the stuffing had to be different. After going through the fridge I came up with shallots, cremini mushrooms, celery and chopped ham that were sautéed and when cooled mixed with Mozzarella cheese and seasoned with Herbes de Provence, fresh chopped rosemary, chopped parsley, balsamic vinegar, white pepper and hot sauce and deglazed with 1/2 cup of dry Marsala. Tenderloin was cut lengthwise almost through, opened up and flattened with mallet between 2 sheets of plastic film. The whole process can be seen on this video from Food Wishes. I used different stuffing but process is exactly the same. Roll the meat, tie it up and roast at 375 °F for 30 minutes. I have roasted parboiled and quartered red potatoes in same pan and at the same time. The taste of this roll was incredible, it had a hint of game meat, like a rolled venison breast. 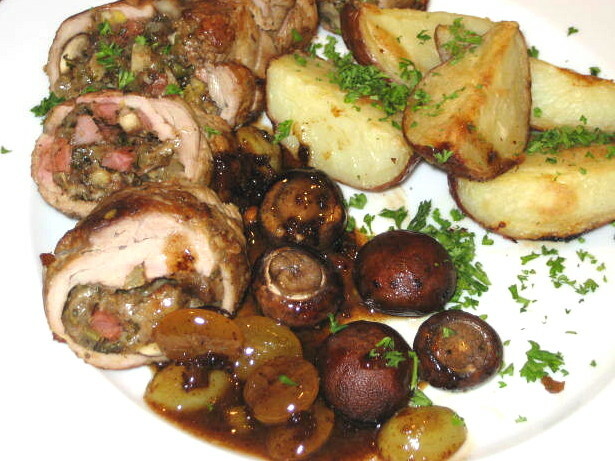 The Herbes de Provence, rosemary, Marsala and Balsamic vinegar just shined through.